The back court duo of Jayson Castro and RR Pogoy continues to lead the TNT KaTropa to wins. The two came alive in the latter stages of the fourth quarter and in OT to lead their team to a big win over the Magnolia Hotshots, 80-75. Castro finished with 24 points, five rebounds and four assists. Pogoy waxed hot with 26 points to lead all scorers. He hit five treys and had eight boards to go along with his point production. Ian Sangalang and Robbie Herndon led the Magnolia offense. The two combined for 31 points. The offense came slow and far in between for both teams to start the game. TNT couldn’t get their offense going as they only scored nine points in the first period. Magnolia couldn’t take advantage of the slow start, scoring only 13 of their own. The game was a gritty, back and forth affair between both teams the rest of the way. TNT was only able to take a lead as big as five points and Magnolia was only able to take a six-point advantage. Late in the fourth period, the two teams started to trade baskets. Troy Rosario snatched the lead back for TNT with a three-pointer. Jio Jalalon answered back with a three-pointer of his own to give the lead back to Magnolia. Pogoy and Rafi Reavis exchanged baskets with Magnolia taking a one-point lead. Jalalon added a free throw to give the Hotshots a two-point advantage with 10 seconds left in regulation. The KaTropa went to Castro for their final possession. Castro ran the two-man game with Rosario but was immediately double-teamed in the perimeter. He rose up for a three-pointer over two players but at the last moment dumped off the pass to Rosario. The TNT big floated a shot that landed into the hoop to tie the game, sending it to OT. In OT, Pogoy caught fire. After Castro tied the game with freebies, he nailed a three-pointer to give TNT the lead. He then scored on a turn around jumper to increase their lead up to five. They protected that lead all the way to the end. 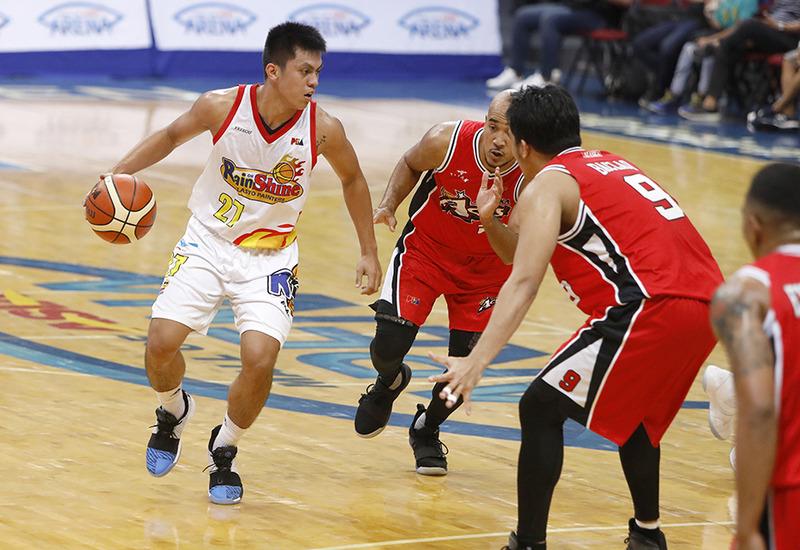 In the first game, the Rain or Shine Elasto Painters took care of business against an undermanned Alaska Aces squad. Rain or Shine’s took down Alaska, 85-72 for their fourth win of the season. The Aces were missing the services of key players Simon Enciso, Vic Manuel, Jvee Casio, Kevin Racal and Noy Baclao. They had to make do with their bench for this game. Unfortunately, that wasn’t enough against the balanced attack of the Elasto Painters. After they were able to tie the score at 12-12 early in the game, Rain or Shine went on a 13-2 attack to close the first period. Maverick Ahanmisi, Rey Nambatac, Raymond Almazan and Ed Daquioag all got on board to push Rain or Shine’s lead up to double-digits. The Elasto Painters continued their attack in the second period. 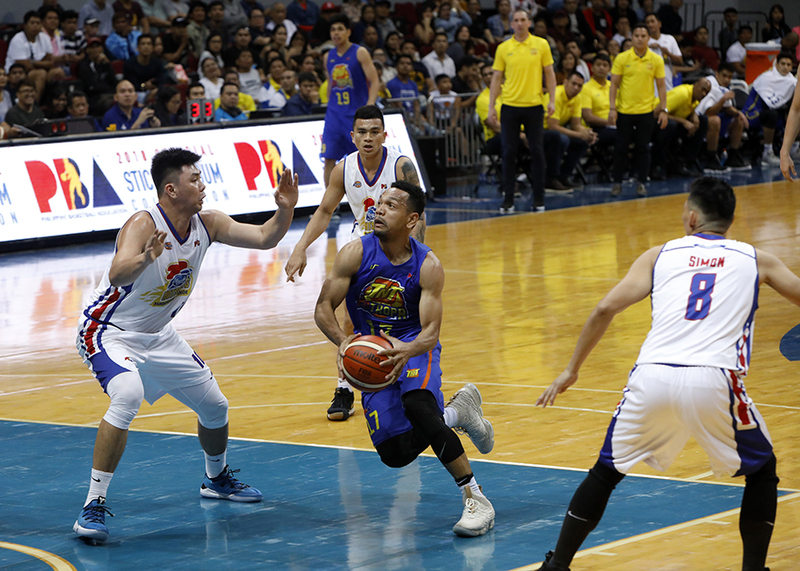 After Alaska cut the deficit down to just eight, Rain or Shine answered right back with a run to to push the lead up to an insurmountable number. Beau Belga and Gabe Norwood nailed back-to-back treys to push Rain or Shine’s lead up to 14. Nambatac and Norbert Torres added key baskets to push the lead up to 21. That was too much for the Aces to overcome. Nambatac led the Elasto Painters with 12 points. Belga added 11. The Elasto Painters got production from all but one player fielded in the game. Jeron Teng led Alaska with 15.